Home / bring oDesk to your city / Internet / oDesk Contractor Appreciation Day / Work / Vote for the Contractor Appreciation Day and Bring oDesk to Your City! Vote for the Contractor Appreciation Day and Bring oDesk to Your City! oDesk features the Contractor Appreciation Day! Vote for your city through the oDesk Facebook page and the party might just be held where you are! I just voted for Manila, Philippines and got a screenshot of the current voting results. Voting culminates and final tally will be announced on March 21. Manila is at least in the top 5 but unfortunately not on the number one spot. If you are an oDesk freelancer and are based in Manila or anywhere else in the Philippines, please vote so we can hit that coveted top spot. Should you be located elsewhere around the world, you can vote for your city too. We all love friendly competitions. As of the moment, the city on the top spot is Dhaka, Bangladesh. I actually saw the invitation to vote through oDesk itself a few days ago. A banner for this promo is flashing right on the home page when you’re logged in. If you vote directly from oDesk, your location is automatically logged and once you’re done, voting redirects to the oDesk Facebook page. You’ll then read a confirmation message saying your vote has been tabulated. I voted again today directly through the Facebook page. Apparently, you can vote more than once. In fact, one person can enter one vote daily as per voting rules. So you can come back the next day to vote again. The rule also did not mention that the city with the highest vote gets the party. If you scroll down the voting page, it does say that oDesk will choose a city from among the top voted cities on the list. But nonetheless, voting is needed to keep your city among those with the highest number of votes and of course, that coveted top spot. 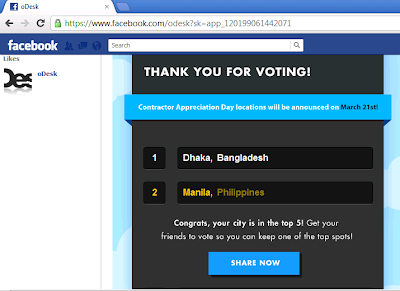 You have two ways to vote for the oDesk Contractor Appreciation Day. First, just log in to your oDesk account and look for this message, “oDesk may visit your city to celebrate our inspiring contractor community. Vote today to have a Contractor Appreciation Day near you.” It’s prominently displayed on the upper section of the page, right below the header tabs and before the page content. Click on the vote today link and you will be redirected to the voting page. As mentioned earlier, your vote is automatically counted when you’re logged in to oDesk. Another way to vote is to simply visit the oDesk Facebook page. Look for the oDesk @ Your City on the left hand side among other tabs (or simply click on the link here). Scroll down the list of areas and look for your corresponding city. Click on the city and scroll down for the Submit Your Vote tab. You can still vote and invite others to do the same if your city is not yet on the list. If it is, you can bring your city to the top by voting for more. Bring oDesk to your city for the Contractor Appreciation Day!